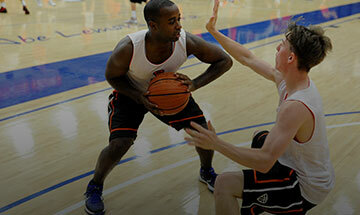 A controlled, on-balance stop – especially in the lane – gives you time to make decisions. By nature we are good decision makers but often lack enough time to make the proper decision. The added time gives you a chance to supplement your move with a variety of fakes. Every great point guard knows that the essence of the game is deception and adding fakes after a stop makes you a more dangerous offensive player. Many of the specific finishing moves we teach at our Essentials program originate from an on-balance body position. Stopping on a dime allows your body the ability to get on-balance and then finish with greater control than taking off on 1-foot. When you take off on 1-foot, shot blockers can easily time their jump due to the simple law of gravity: everything that must go up, must come down. Leaving the floor with 1-foot take-offs leaves you susceptible to shot blockers; however, a stop leading into a 2-foot take-off does not allow for a shot blocker to easily time their jump – especially with the use of numerous fakes.